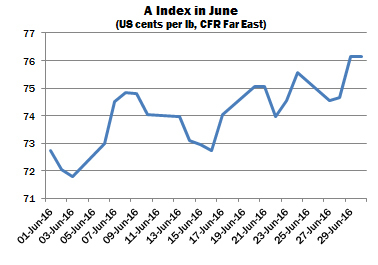 International cotton prices moved higher during June, influenced by upward movements in New York and strengthening ‘basis’ levels relative to that market. The A Index fell to a low point of 71.80 US cents per lb early in the period, but subsequently advanced to end the month at its highest value so far in the 2015/16 season, 76.15 cents per lb. The A Index increased by almost nine percent since early January. 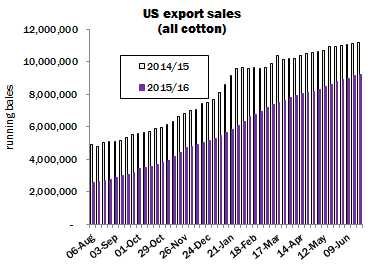 The pattern of international mill demand remained focused on cotton available for nearby delivery, as the tightening supply situation which has been emerging of late crystallised during the month. Higher asking rates had tended to discourage mill buying early in the period, but those spinners who had been proceeding with caution generally displayed a more active import demand, in realisation that availability appears likely to be very tight over the coming months. The Indian subcontinent was particularly active, influenced by the short crops in major producing countries, as well as a desire to secure stocks ahead of the approaching Eid holiday, which traditionally signals a pause in business to Islamic markets. Mills displayed demand for a number of origins including West African remnants, US recaps and Australian, with Indian spinners in particular seeking attractive alternatives to the domestic crop, asking rates for which continued their upward trajectory to reach several new seasonal highs. Chinese import demand re-emerged to some extent, influenced by a lack of available domestic supplies, since the volume of cotton offered for sale at state reserve auctions was considered too low to satisfy demand. State auction base prices advanced considerably, resulting in higher raw replacement costs and eroding some of the regained competitiveness which had been experienced by Chinese spinners in recent months. However, the negative effect on spinners in China has potentially been mitigated by the persistently high raw cotton prices prevailing in India and Pakistan, which in turn have been supportive of yarn export rates from those destinations. Turnover on the state reserve auctions remained heavy throughout June, with the average proportion of cotton sold during the series so far at around 96 percent of daily catalogues. Roughly 60 percent of the volume sold by the end of June had been taken up directly by mills, while the balance had been sold into trade hands. Merchants selling onward to spinners benefited from the upward direction of prices, which continued on the Zhengzhou futures market as well as in New York. Over half of the total catalogue to be offered during the entire auction series, due to conclude at the end of August, had been sold by the time of writing. Should the current strength of demand persist, the two million tonnes earmarked for sale this season will be disposed of, which would still leave approximately nine million tonnes in government warehouses. US export commitments continued behind the pace of last season, largely owing to reduced sales to China, which are placed around 68 percent behind the volume committed by the same point in 2015. In USDA’s latest report, a shortfall of just over two million bales in total was in evidence from last season. Turkey and Vietnam have continued to feature prominently in reports, which would indicate that mills in need of cover have failed to be deterred by either the imposition of a three-percent anti-dumping duty on US cotton (in the former destination), or the recent appreciation of the US dollar, which served to push up the cost of cotton imports. In the last regard it should be noted however that some textile and clothing exporters stand to benefit from the strong dollar. Attention turned increasingly to the progress of Northern Hemisphere crops ahead of the start of the 2016/17 season. The Southwest monsoon has been active over India and weather models continue to forecast ‘above normal’ rainfall levels during the season as a whole. However, expectations of patchy precipitation in some important growing regions, such as Gujarat’s Saurashtra, and the perception by farmers that cotton is at risk of pest infestations, following last year’s struggle with whitefly, have diminished enthusiasm for the crop. Our estimate of planted area has therefore been trimmed from our May assessment, though an improvement in yields and therefore higher production than in 2015/16 remain in prospect. Similar conditions prevailed in Pakistan, where Cotlook’s latest production figure also underwent a reduction, albeit a smaller one than in India. Area is apparently facing up to a ten percent decrease, which would represent the smallest plantings since 2002/03, though higher yields and lower abandonment are still expected to result in an outturn higher than the current season. Cotlook’s estimate of Chinese production was reduced, owing mainly to unseasonable weather in Xinjiang, which caused damage on some fields and is likely to have impacted yields. USDA’s Planted Acreage report, released on the last day of June, pitched cotton area in the United States at 10 million acres, an increase of 461,000 acres from the March Planting Intentions report that foreshadows an increase in forecasts of output from the figure (just over fifteen million bales of 480 lbs) indicated hitherto. Estimated area is up 17 percent from the previous season, influenced by a more positive picture of soil moisture than has been witnessed in several years. Cotlook’s assessment of world consumption has been little altered, with the envisaged improvement between seasons remaining at a modest 1.4 percent. The strength of Chinese demand in recent weeks has led some observers to increase their ideas of Chinese consumption, though Cotton Outlook’s assessment remains unchanged for the time being. Global stock levels are estimated to decline by over two million tonnes in the current season, while in 2016/17, a contraction of almost one million tonnes is envisaged. Both adjustments occur predominantly in China, making some inroads into the huge government stockpile. 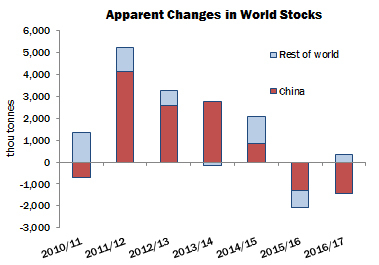 A moderate reduction in the rest of the world is anticipated in the 2015/16, while at this very early stage, our forecasts indicate that in 2016/17 stocks outside China are expected to rise, placing in doubt the durability of the latest upturn in world prices.